The tunes are available for listening or downloading. but may act strange trying to play the files. Not a lot of jazz action in SLC this year, but I still recorded get some fun stuff. Probably the most innovative band in SLC at this time is the Joshua Payne Orchestra. Here's two tunes from an Urban Lounge gig that was quite exciting: Bourne and 300. 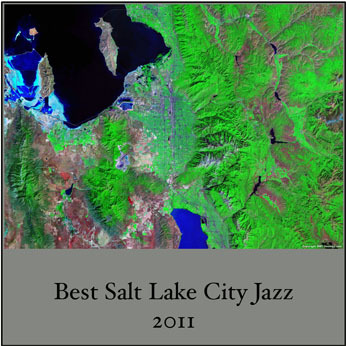 Many of the fine young jazz musicians in SLC come out of the University of Utah Jazz program. Will I didn't exactly record this tune (thank you Music Dept. Library), I thought I should include it. This is the 2011 U of U Big Band, featuring Willis Clow on guitar, trading riffs with the conductor and great sax player, David Halliday. Not sure of the title, but it sounds like an elaborate arrangement of Caravan. OK, now I'm going to cheat some more. The following four tunes were recorded by me in Southern California. But since they all feature Willis Clow once again on guitar, and he's from SLC, and they are great tunes, I thought I'd include them here. From the famous jazz club Steamer's in Fullerton, I recorded Buck's Vibe. First, one of their funk tunes, Second Line Sally, and second, a Willis Clow original, A Frail, Soft Goodbye. Check out the new Buck's Vibe CD, just out. From an incredible venue in San Pedro, Alva's Showroom, I recoded the guitar ensemble, Wirechoir. Here's their versions of I Surrender and Seven Come Eleven. Willis takes the first solo on both. Finally, back to SLC, and the battle of the big bands. This was an amazing night, with SLAJO on one side of Kilby Court, and the Joshua Payne Orchestra on the other end. They teamed up for a version of Herschel Bullen's composition Wreckrium.